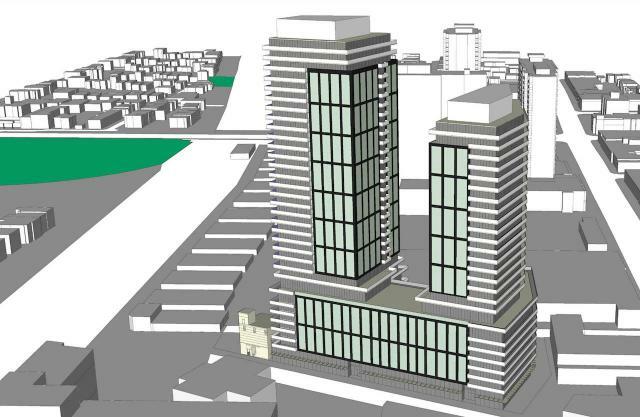 A new proposal from Trolleybus Urban Development is seeking rezoning to permit a pair of condominium towers on a 0.38-hectare site located on the west side of Dawes Road and south of Danforth Avenue in Toronto's Danforth Village neighbourhood. The plan for 10 Dawes calls for an IBI Group Architects-designed complex to rise next to a 1906-built grain elevator and mill at Dawes Road and Guest Avenue. Developer: Trolleybus Urban Development Inc.